My high school friends and I got a bit silly last night, we ate lollipops and watched my Spice Girls videos, we also read my Spice Girls book and had a Spice Girls game show quiz. I have unusually extensive knowledge of Spice Girl trivia, especially lyrics, so I got pretty competitive. When I was 8 I was just obsessed with the Spice Girls, absolutely, completely and utterly OBSESSED - no different to how I get with Madonna now really.. I would collect cut-outs of them from magazines, and I also used to collect their 'Spice Girl Photos', which were these packets of about 6x8 printed photographs of them and you used to trade them and put them in albums and stuff. Anyway so all night we reminisced over Spice Girls documentaries on VHS and of course the movie, and classic film clips. Brilliant. I feel like the Spice Girls were a really positive thing for us when we were young girls. It was all about girl power and celebrated individuality or something. I loved how there was always a Spice Girl we could align ourselves with. 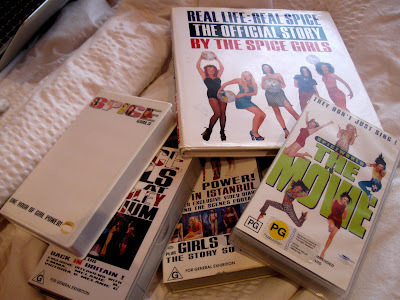 In my research, I found that Baby Spice was the most popular - when I was younger I liked Sporty Spice, personally, but now looking back I would totally be a Ginger Spice fan. She just totally rules.